We teach beyond the dance studio at everybody dance! Thanks to our incredibly generous community partners, such as the Wallis Annenberg Center for the Performing Arts, our students have the opportunity to observe and learn directly from professional dancers, choreographers and master artists. Often for the first time in their lives, they can envision what is possible for their own lives. We create sign-up sheets, rent buses, and take our students around Los Angeles so they can see and experience firsthand what dance looks and feels like in all its forms. They just love it and we’ve seen them grow in front of our eyes because of it. And after the field trip? 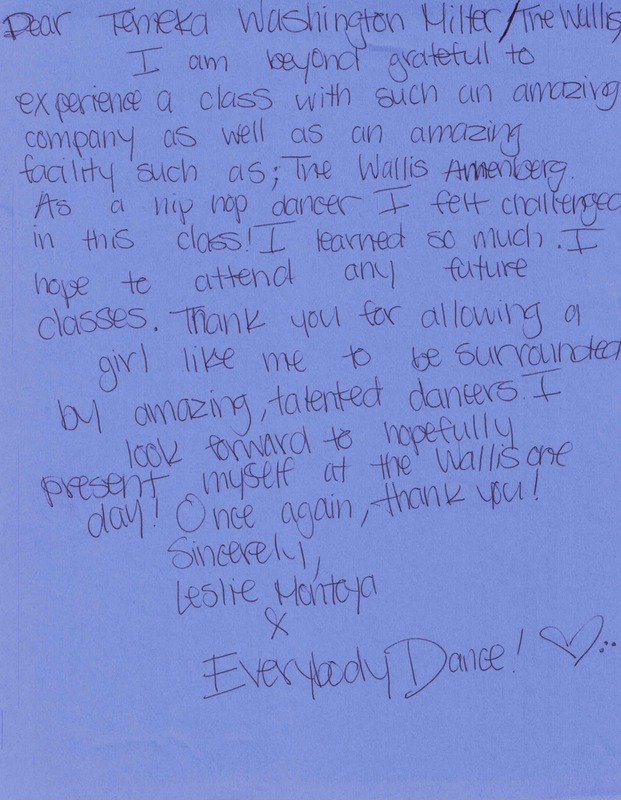 We encourage them to say thanks and to reflect on what they learned about themselves, dance and others. Rather than tell you what they’ve told us, we wanted to share with you what they’ve written. Enjoy!